We had such a laid back Easter, we stayed in our PJ’s all day! It was nice to have a relaxed holiday, where we didn’t have to be anywhere or do anything on anyone’s schedule but our own! This also meant that didn’t sew anything for my kids this year! I did sew up a dress for my friend’s little girl though! We went fabric shopping back in January, and I let Miss B pick some fancy fabric for a dress. I waited for the right pattern to come to me and was really getting stuck on what dress to make, as I have been using the bateau from Winter Wear Designs, but knew she already had at least 2 of them! 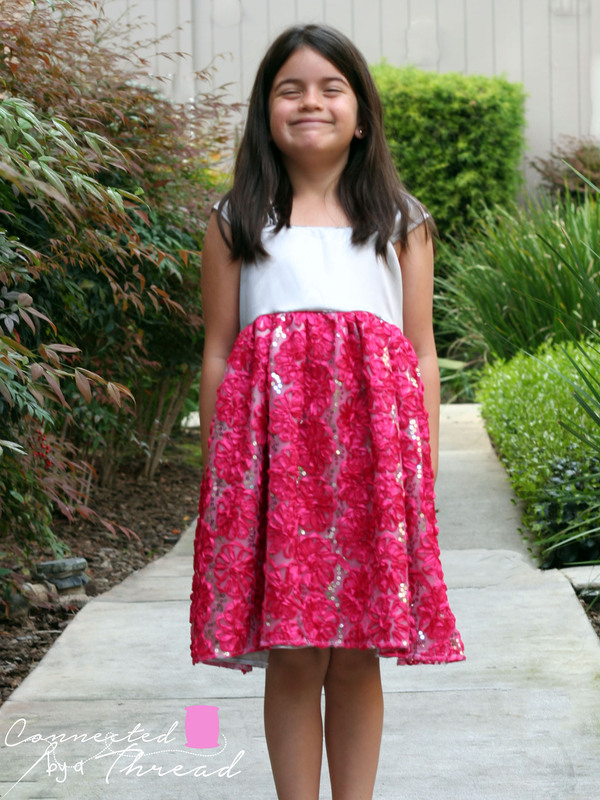 Then Jessica from Izzy & Ivy posted about her sew a long for the Emory dress! Perfect! The pattern is designed for cotton woven, so I had to make a few adjustments like leaving the adorable pockets off the skirt! 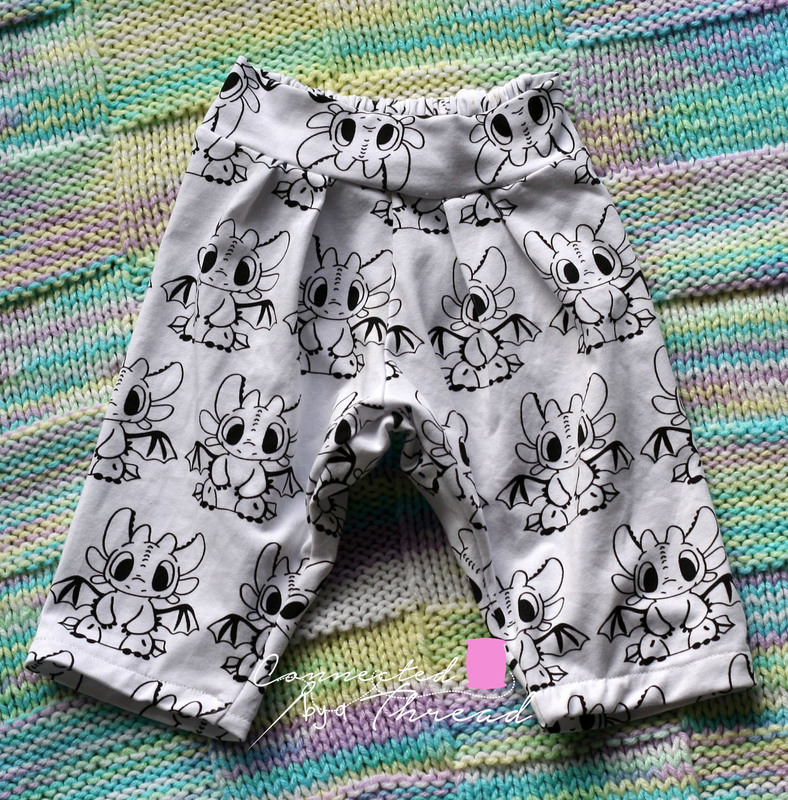 They are super cute, but wouldnt have looked right with the pattern of the skirt! The second thing I did was line the skirt with the same fabric from the bodice. I also did a much narrower hem for the bottom of the skirts, this was more of a personal preference as I don’t like a wider hem on this fabric. The sleeves are a super cute gathered band, and in the satin fabric, I love the way the light bounces off of it! For the back, I needed two buttons. I didn’t have any in my stash that would match this dress, so I opted to make my own covered buttons. they came out so sweet and are the perfect touch to finish this dress! A word of advice if you attempt this type of dress, I would take a few inched off the width of the skirt, and put a heavy duty needle in your machine for attaching the skirt to the bodice, I broke 4 needles before it dawned on me to use a heavy duty one! I have been told that Miss B loves her new dress and even tried to wear it to some Easter festivities on Sat (mom was saving it for Easter Sunday!). I love sewing for her becasue no matter what I make her, she always wants to wear it! I hope you had a wonderful Easter! 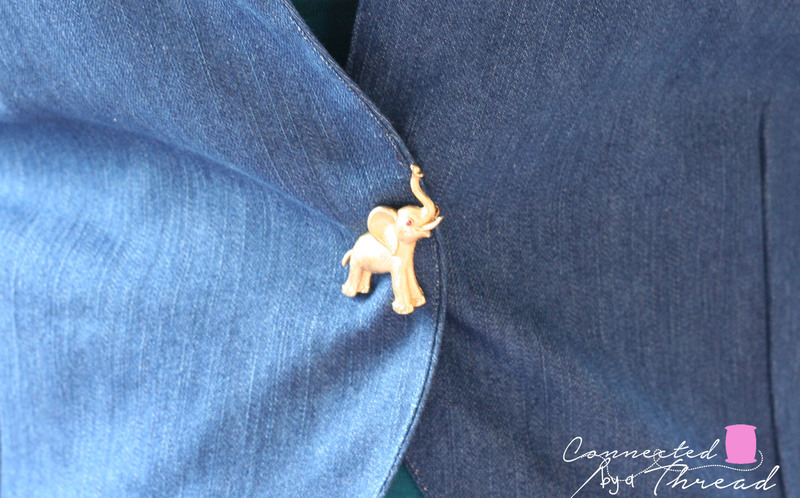 Check out what some of my favorite bloggers sewed up for the holiday! 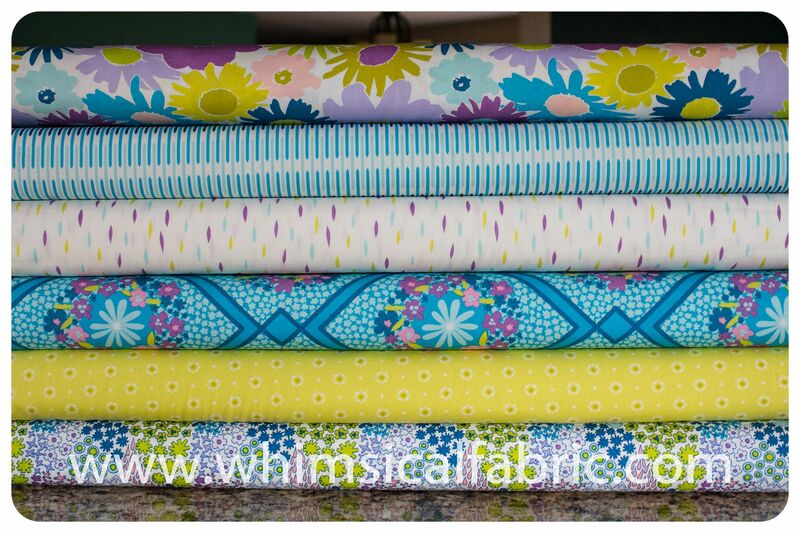 Every other Wednesday, Danielle from Whimsical Fabrics puts a bundle of fabrics on sale in her group for a special price. I have been purchasing mine ahead of time. We have had a blast picking out patterns and brainstorming what can be done with these bundles. This weeks is Dreamy Vintage in the Berry color line by Art Gallery Fabrics . It just screams spring and summer! I loved this line the moment I saw it, and knew I would be sewing up something sweet with it…I just didn’t know what that would be just yet… I started looking through patterns, nothing was jumping out at me and screaming “This is the pattern!! 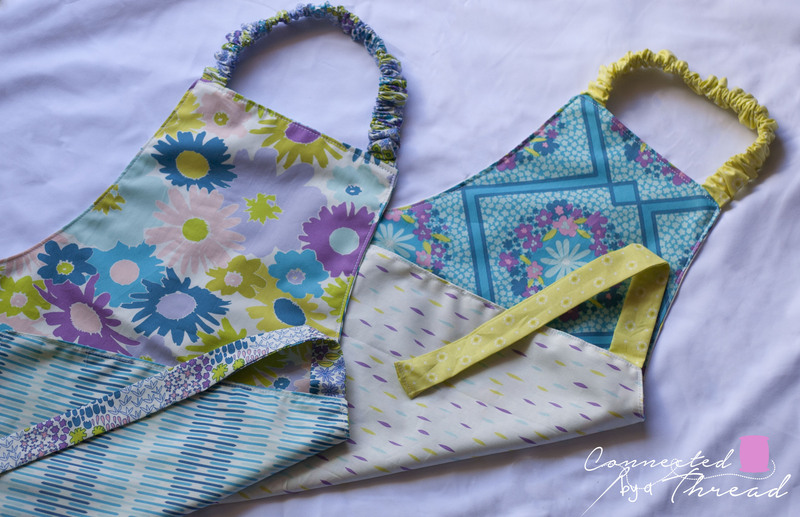 !” I rarely buy a new pattern anymore since I have so many already, but when Denise from Whimsy Couture posted about her apron pattern, I knew I had my pattern! How sweet are these? 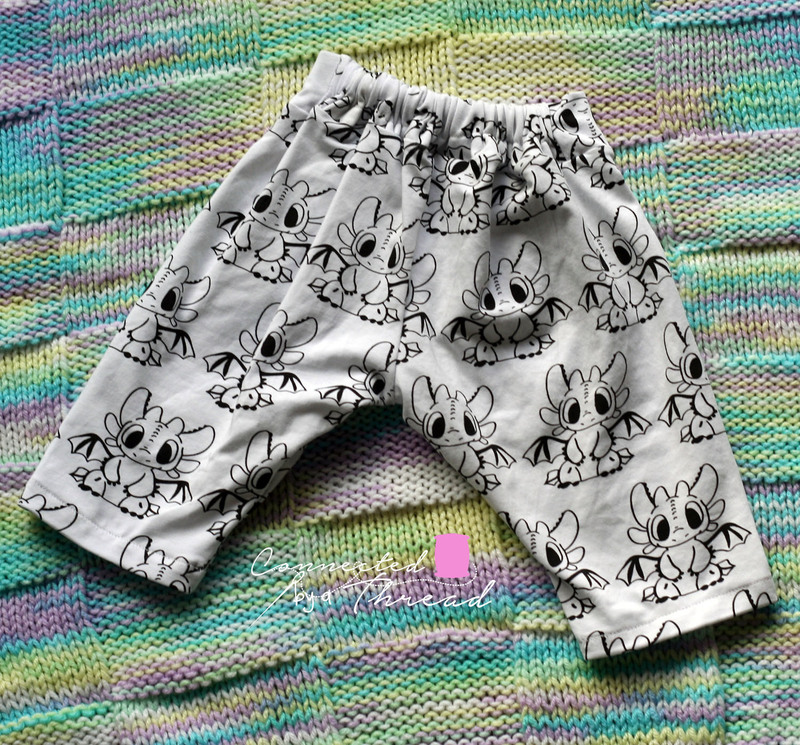 and I love that they are totally reversible if you want then to be! 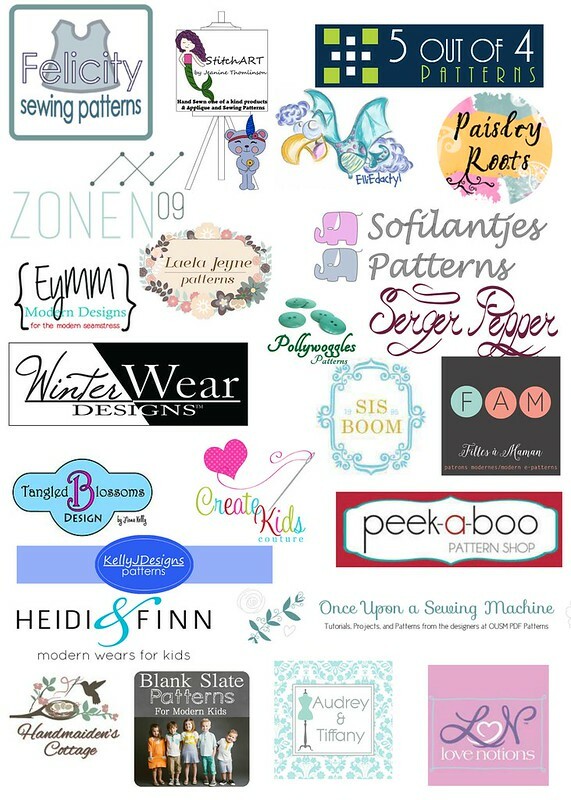 -perfect for embroidery, monograms, FMA..any add-ons you can think of! 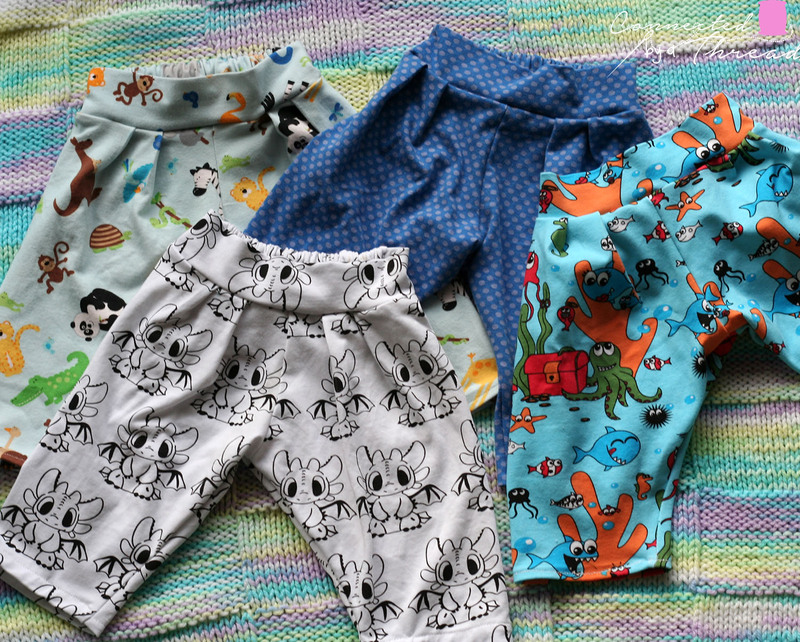 I chose to sew up the size small (12 months to a 2T and Medium (up to a 5T) in a simple version to really showcase these beautiful fabrics! 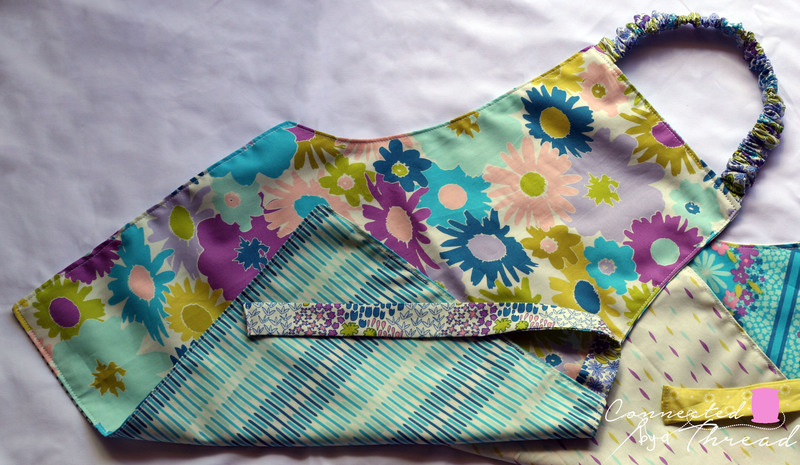 There are 6 in this bundle, and I was able to get 8 aprons out of a 1 yard bundle, this scraps left over. The pattern sews up super fast! I made 2 aprons in about 20 min from cut to top stitch.I already have a bunch more planned in my head, including a few scrappy ones that will make perfect art aprons! If you haven’t shopped the Wacky Wednesday deal before, here is how it works: At 12 noon CST (1 pm EST, 10 AM PST), Danielle will post the fabric for todays deal. 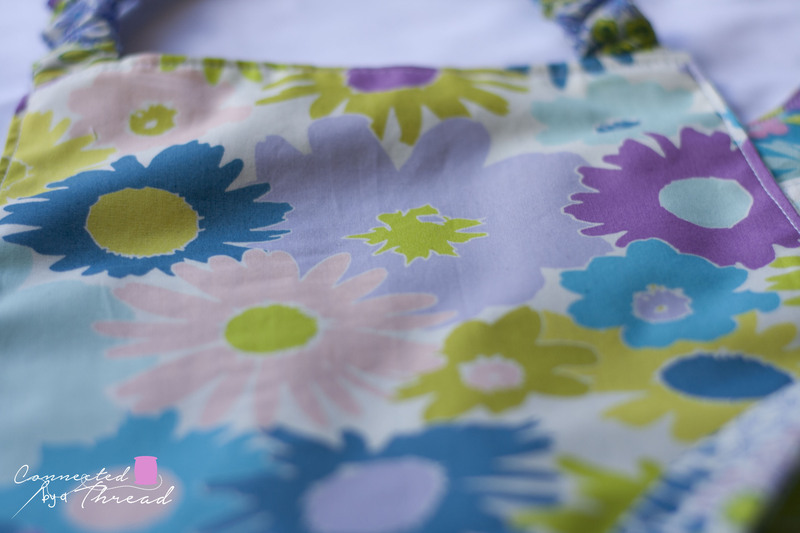 Be sure to be in the Whimsical Fabric & me Facebook group so you don’t miss out! These deals are usually good for 24 hours, but has been selling out quick lately! Once you buy your bundle, be sure to come back and tell me what you are going to make with yours! 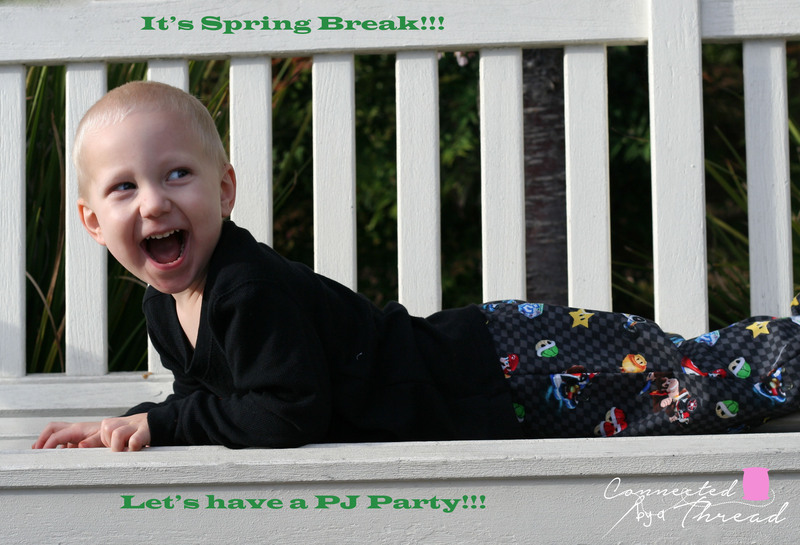 It’s a Spring Break Pajama Party! When I saw this tour, I had all these big plans to sew PJ’s for everyone in the house. Then the husband said he wouldn’t be in pictures. So I decided to just sew for the kids. Picking a pattern for the teen was easy! She fell in love with my Comfy Cozy Pj’s from Laela Jeyne*. 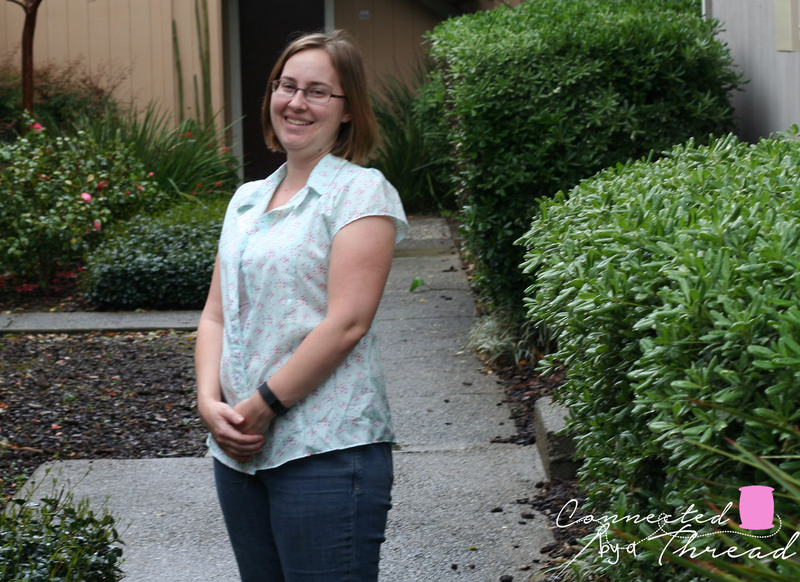 You can read more about the pair I sewed myself during the testing in this post. For hers, I chose the shorts and short sleeves since spring is on its way. I have had both flannels in my stash for a while, with the plan to make the toddler a Star Wars rag quilt. She decided she really liked the combo though, so I went with it. She has worn them to bed twice this week already and keeps telling me she loves them and that they are the best PJ’s ever. I only modified them to have snaps rather than buttons since I didn’t have any buttons that would match! 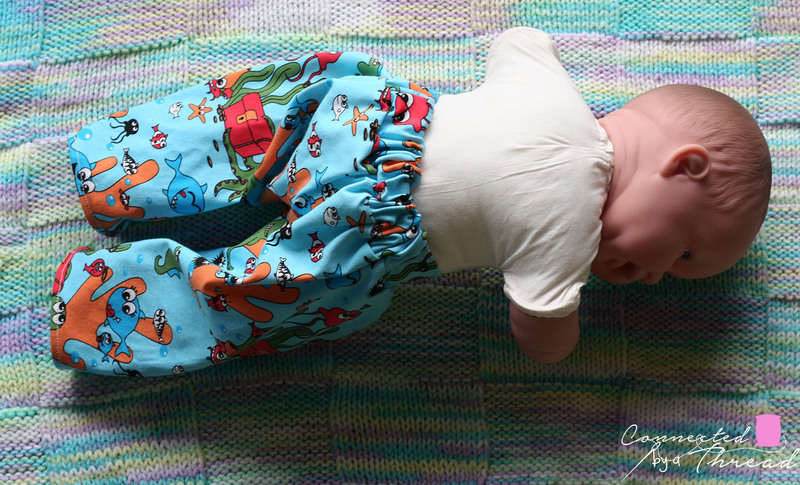 For the toddler, I knew I would make him some sort of cotton pants, but I really wanted to push myself to use one of the (many) patterns I own but have never sewn. I ended up choosing the Tie Dye Diva Snazzy Pants. I should have sewn a size up for him, the 3T was a little short in the rise for him. 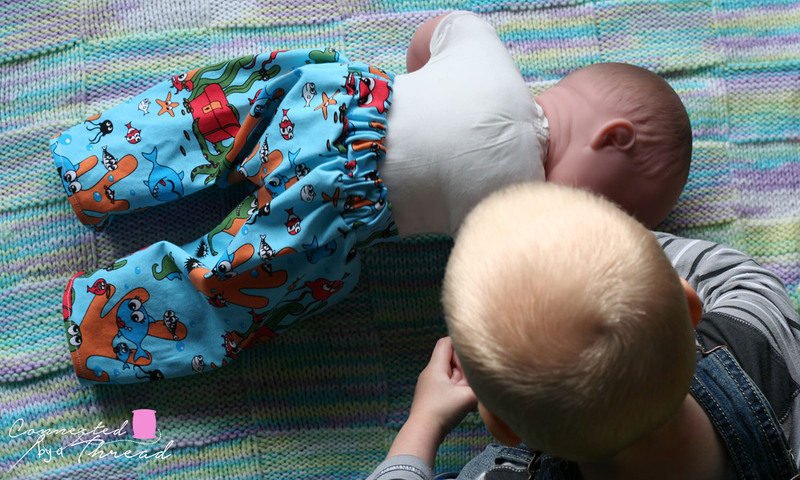 He is not too fond of his new pants, so trying to get pictures proved near impossible. A few M&M’s and he gives me a little bit of a smile. I paired his pants with a RTW thermal since we took pictures outside. Over all, the pattern was super quick to sew, and it went together really quick! Of course, they can never take a nice picture together, but they really do love each other! 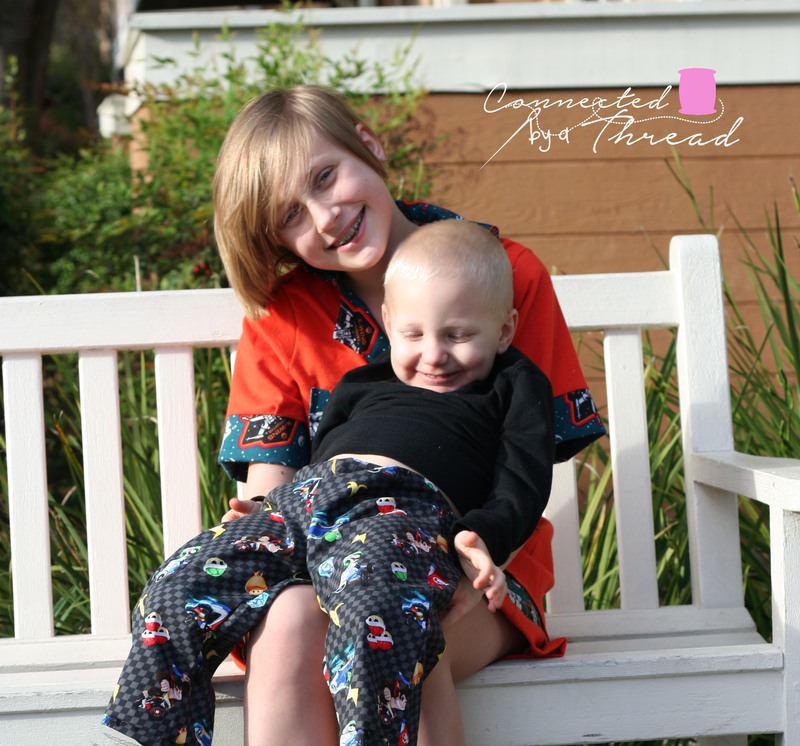 Hopefully, you are ready to sew up some PJ’s for yourself or your kids! Be sure to comment with what patterns you want to use and enter the giveaways below! Along with today’s daily giveaway (see below!) there is also larger giveaway and a link up happening. Go to today’s post over at Create 3.5 to get the full details on how to link up and to enter the giveaway! Mabel Madison is offering 20% off with the code JAMMIES. Code expires March 31st! PhatQuarters is offering 10% off OR FREE shipping to US addresses on orders over 40$ US (with an equivalent discount for international shoppers). Use the code PHAT10 for 10% off OR FREE40 for free shipping to US. Today’s prize is sponsored by Serger Pepper and Pollywoggles. You could win 1 pattern of your choice from both shops! 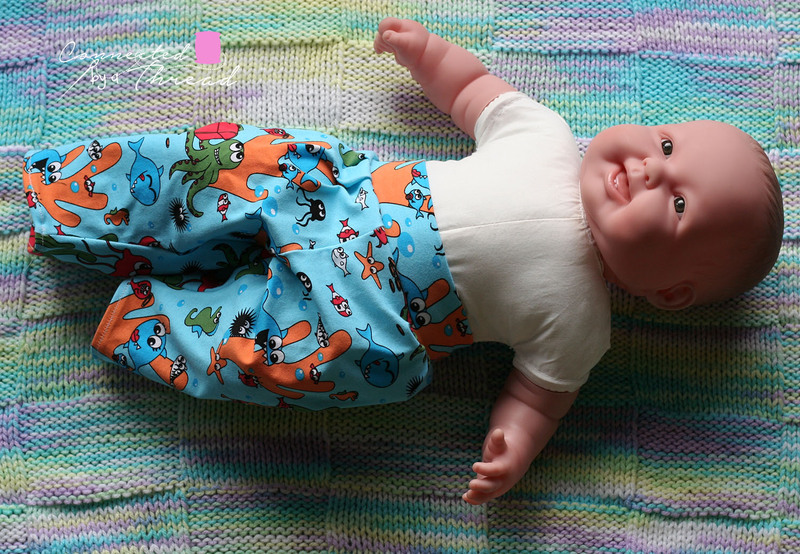 Visit Serger Pepper and Pollywoggles to see what they have to offer. The giveaway ends March 23rd at 11:59pm EST. See the Rafflecopter on how to enter! You have up to 8 chances to win! The winner will be chosen March 24th and will have 48 hours to respond to the email before a new winner is chosen. Want to win more prizes? Visit Lulu & Celeste tomorrow to see what new prizes will be up for grabs as well as see the previews for tomorrow’s bloggers. You still have time to enter yesterday’s giveaway! Go to Sprouting JubeJube’s post from yesterday to enter the giveaway that ends at 11:59pm EST tonight (March 22nd)! Missed a stop on the tour? The full schedule is below! Time for another A Vision to Remember Pattern!! 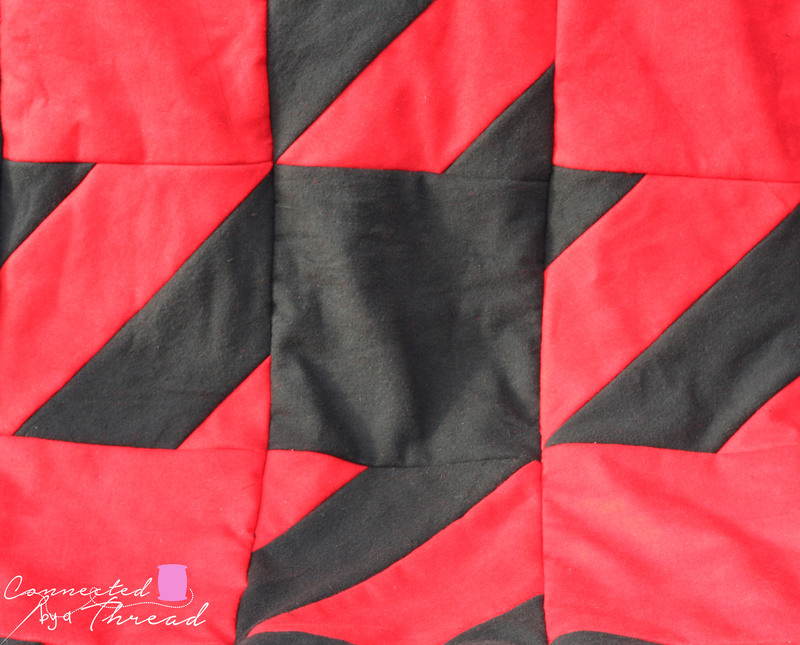 This time, we are using the Houndstooth Quilt pattern. 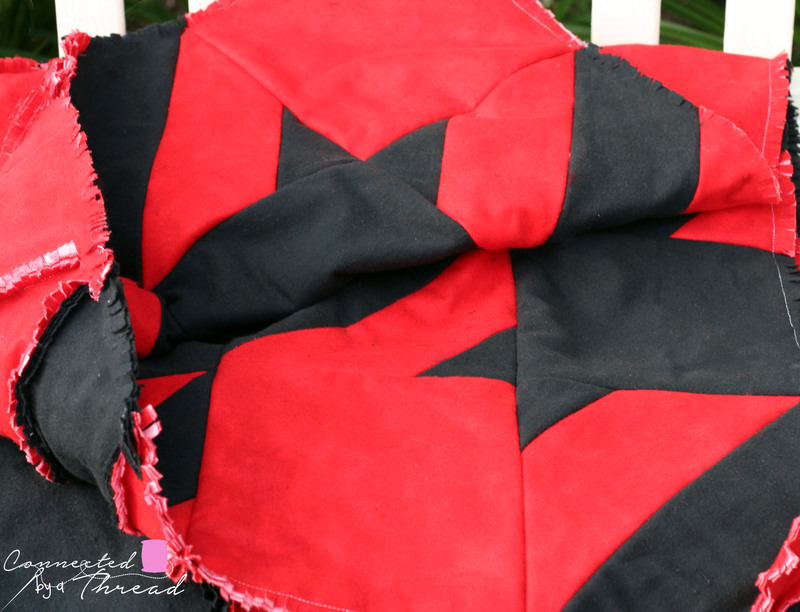 I absolutely love this finished quilt! Whenever I see a houndstooth print or pattern, I think of the old Atari game Space invaders. Something about it makes me think of that game! 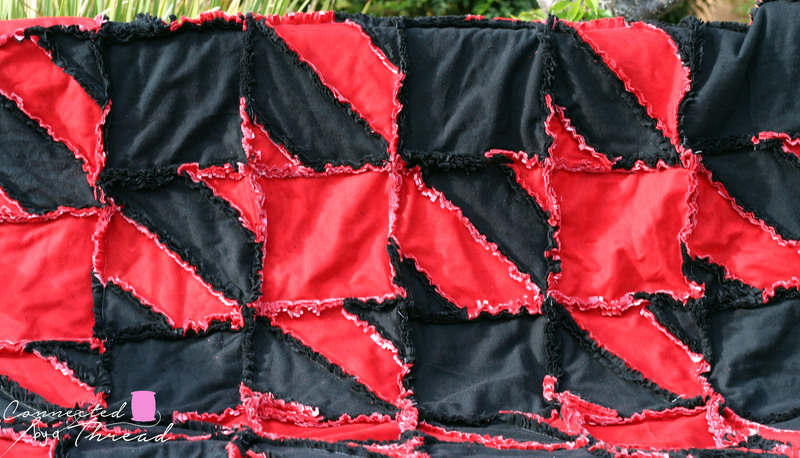 Bobbi (the designer) was so kind to send me the fabric for this quilt. 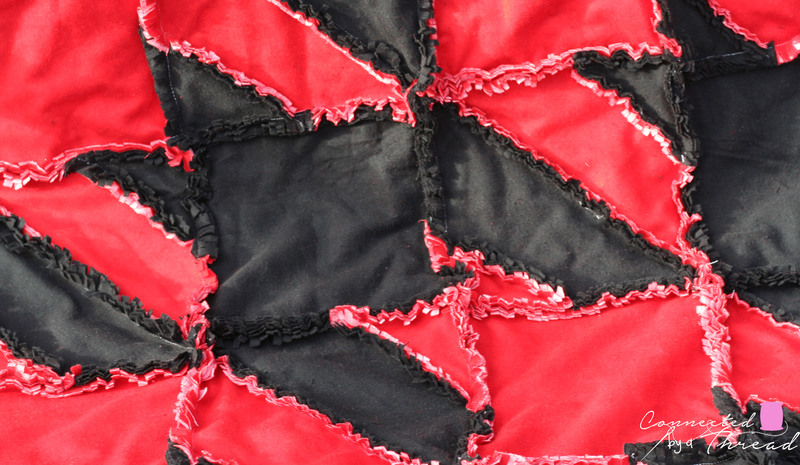 I am always up to sew whatever the designer wants to see, so when she asked if black and red were okay to send, I said sure! 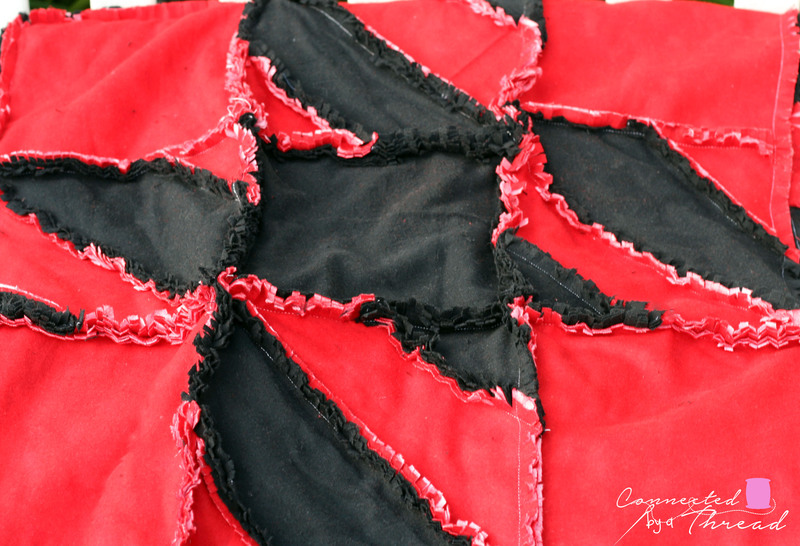 It is not my usual choice of pastels or neutral colors, but I love the contrast of the red and black! the red flannel has a bit of a marbled look to it, which was hard to capture in the pictures. My two year old has already tried to lay claim to this blanket, even though it will go in my shop this week! Even the back looks awesome! Easy to follow step by step directions with pictures and diagrams to help those that are a bit more visual. a final layout diagram is included to help with placing the pieces in the correct order to achieve the houndtooth print. Honestly, the sewing of the pattern was quick. cutting and prepping everything took the longest for me. Of course clipping all the seams takes a while as well. 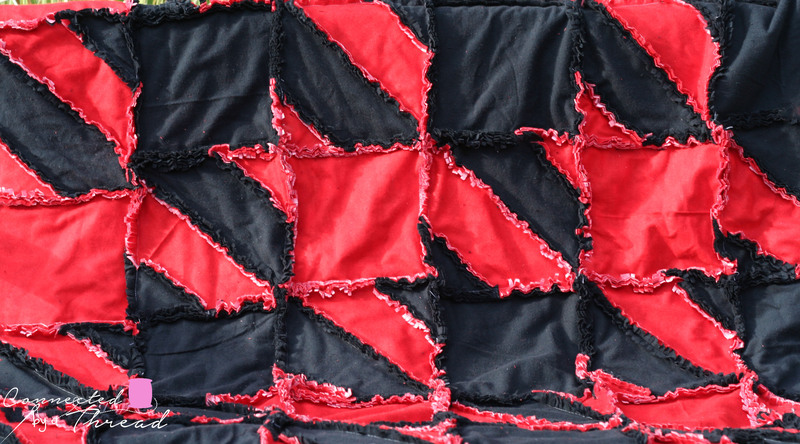 this one has been through the wash once, but once it is washed a few more times, the rag quilt effect will be much better. 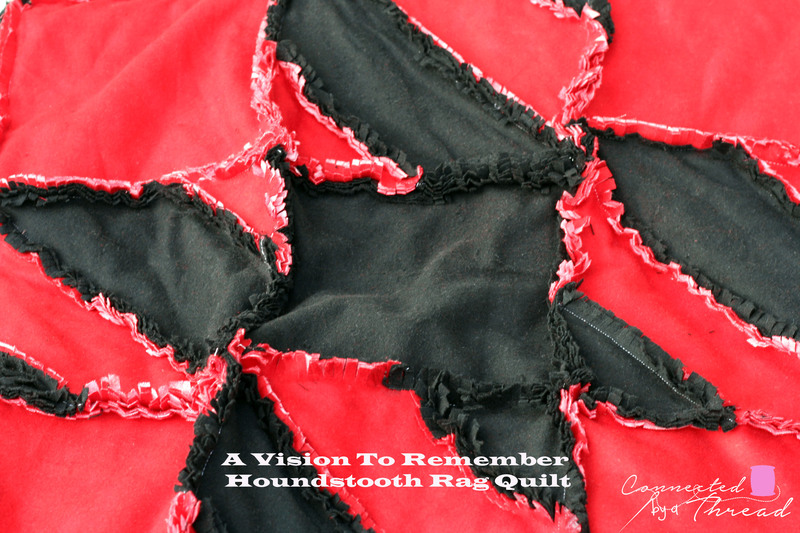 I am already thinking up the next color combinations for my next houndstooth quilt! Be sure to check out all the amazing blankets on tour this week! 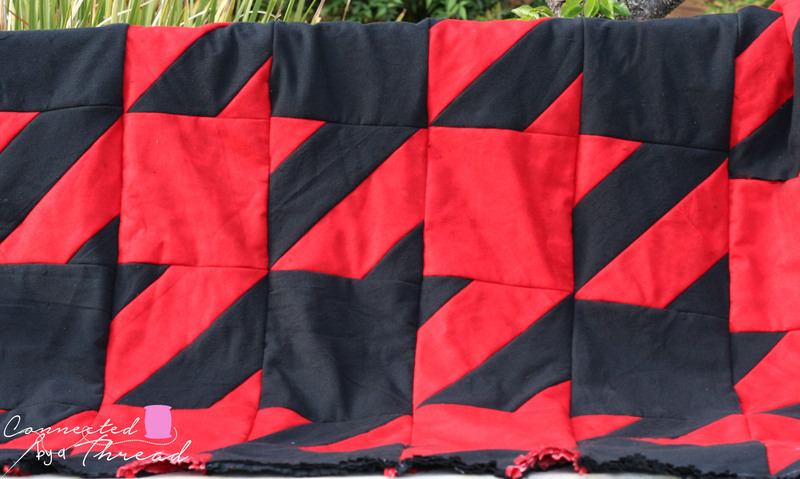 Be sure to check out the other amazing bloggers and their quilts on tour this week! I’m so excited to be the first stop on the Whimsical Fabric Voile tour! I have just recently started playing with voile and venturing to use it for garments. I think what held me back so long was I really didn’t know what voile was! It is really hard to tell from a picture and a description what something feels like or what it sews like. a simple search turned up this: Voile is a soft, sheer fabric, usually made of 100% cotton or cotton blends including linen or polyester. Doesn’t really tell you much right? Well, let me tell you about it! 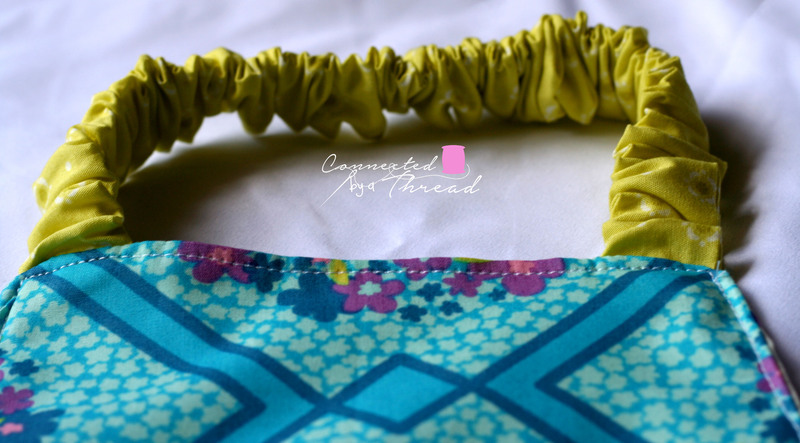 It is silky soft, perfect for tops that don’t need a knit. I have seen some awesome dresses for little girls, and I bet it would make a wonderful maxi skirt (ohh…might have to use the coupon to get some to try that!). For this project, I picked a beautiful light blue with flowers (found HERE). 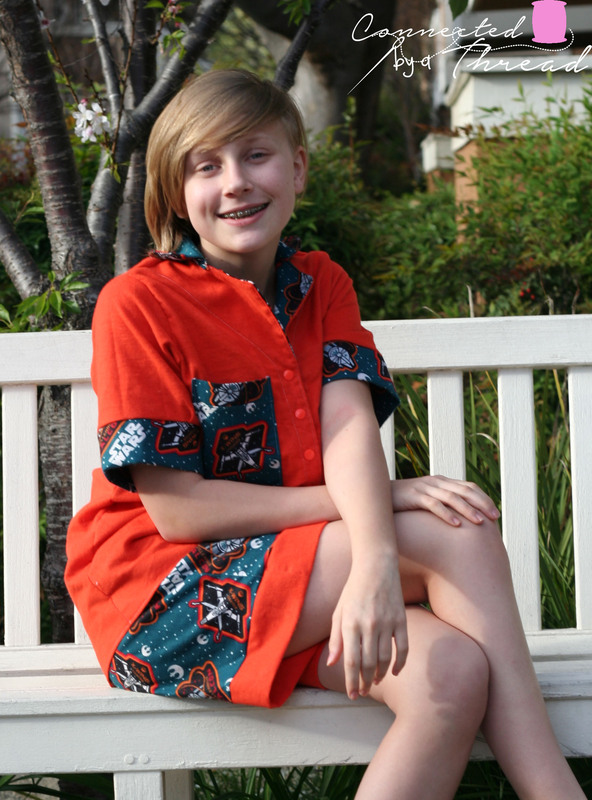 I also picked Winter Wear Designs Button up as my pattern (found HERE). This sewed up so nice! I modified the pattern just a little. I used a smaller seam allowance as I was between sizes. I also turned my sleeves under 1/4″ and hemmed than that way rather than using bias tape (personal preference). I haven’t decided if I want to put buttons on this one or leave it this way to wear over my tank tops this summer! Ok, back to the voile! 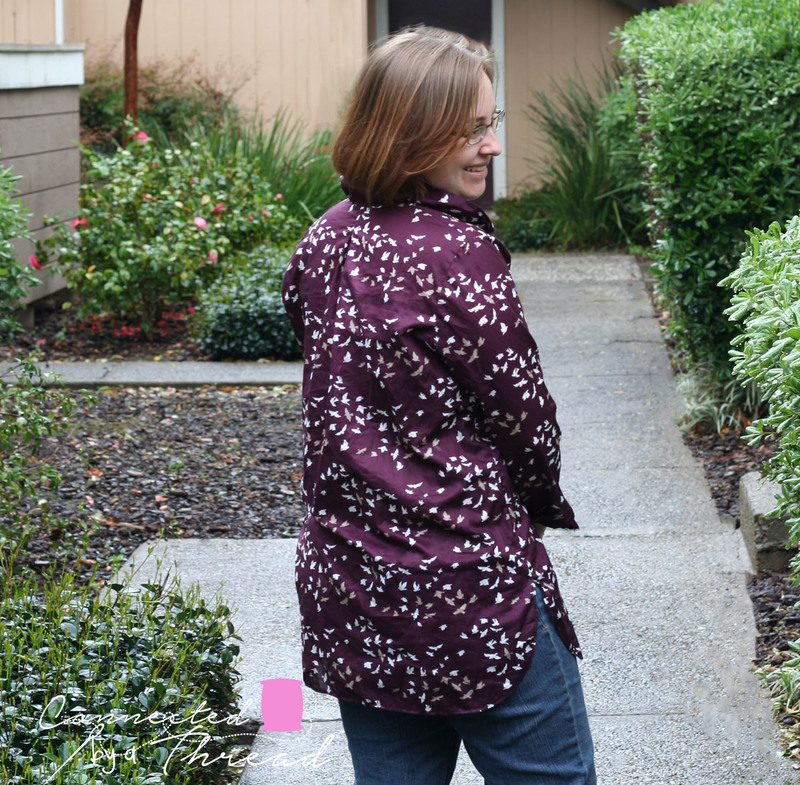 This was the 3rd shirt I have sewn in voile for myself, and I are starting to wish all my shirts were this soft! The fabric has a beautiful drape. My first thought was it would make a beautiful infinity scarf, but I never wear scarves! It sews very nice with a universal needle. My last shirt, I forgot that I had a microtex needle in my machine, and it kept snagging and pulling the fabric. If that happens when you start sewing yours, check your needle! I really flew through the machine like butter! If you find your machine wants to eat the fabric, try putting some tissue paper under it. Fabric washes beautifully but tends to wrinkle easily. This was the only downside I found, as I never iron things, but with this fabric, I need to iron it before I can wear it! 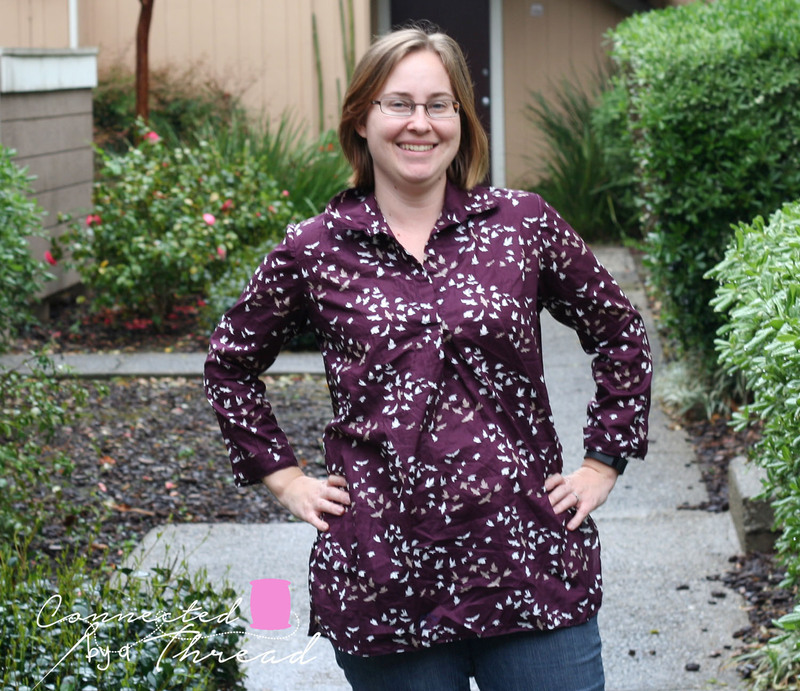 I also made the Gallery tunic by liesl+Co (found HERE). This is one of my favorites to wear! I will share more about this top on Saturday! I hope I have inspired you to pick up some voile and give it a try! Be sure to check out all the posts this week! So many different uses for Voile! One of my new favorite designers is Marissa from Laela Jeyne! Her latest pattern is the Dakota Blazer. This is definitely a staple piece that you will want in your wardrobe! 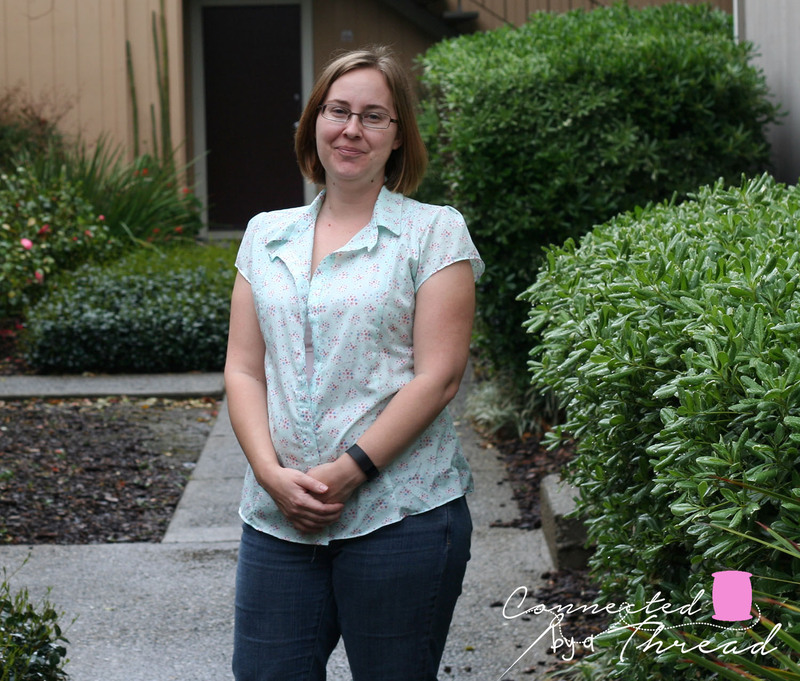 Being a stay/work at home mom, I rarely wear dressier clothes, and don’t keep them in my closet. I needed to Skype with a client a while back and realized that I didn’t have anything other than tees and a few sweaters. This blazer will be the perfect addition to my casual, need to dress up once in a while wardrobe! You can get your copy HERE* for $6.50 today to Monday 11:59PM EST. The price will go up to $9 after that. All the other single patterns are also 30% off during that time. 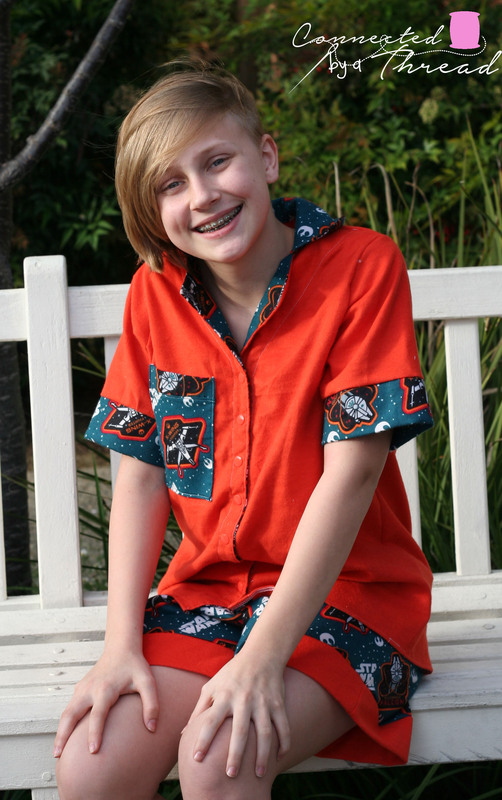 I sewed a straight size Medium with the long sleeves. I love that the pattern has layers, making it super easy to print, tape, and cut out my size. This also helps if you need to combine sizes to get the right fit. I love the high-low hem, as it provides that extra coverage especially when I sit down! I used a stretch denim for the exterior and a heavy costume satin for the lining, and this is a perfect weight for the cooler mornings and evenings we tend to have in the spring! I am thinking another in a linen or heavy cotton with a think lining will be perfect for the summer! 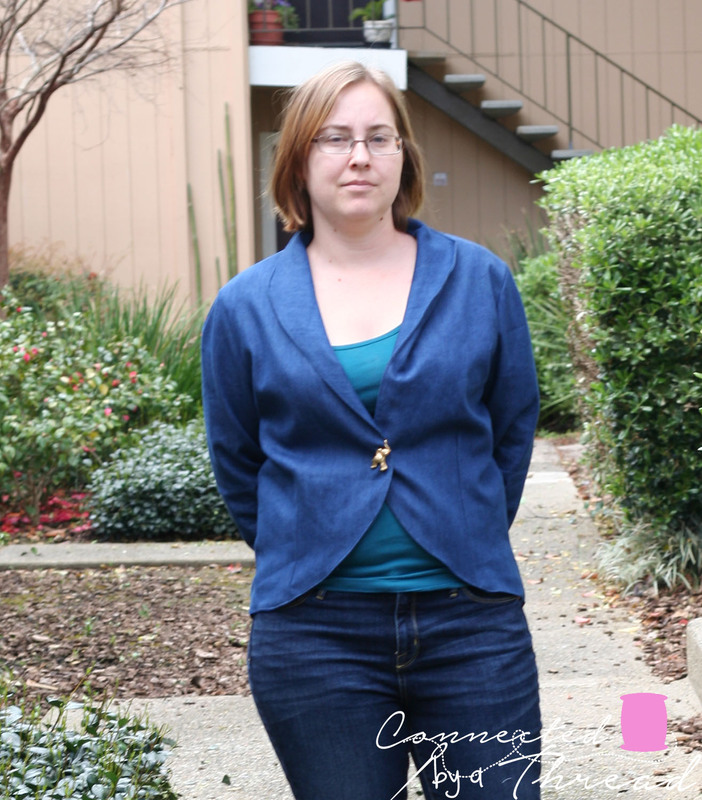 I hope you have found some inspiration to sew up a blazer for yourself! Leave me a comment and let me know what you want to make yours out of!